Debenu PDF Aerialist takes Adobe Acrobat to the next level with its advanced tools for working with PDF bookmarks. Now you can add, copy, import, edit, build, replace, sort, validate and delete bookmarks across one or more PDF files. The tool helps you to use bookmarks more effectively, providing you with a simple way to make almost any PDF file more usable and easier to navigate. 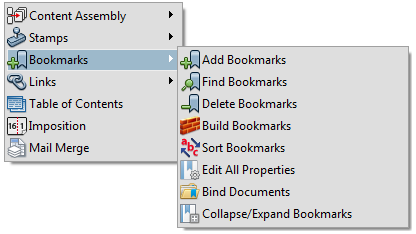 Add Bookmarks – Add, import, export, copy and re-apply a set of user-defined bookmarks. 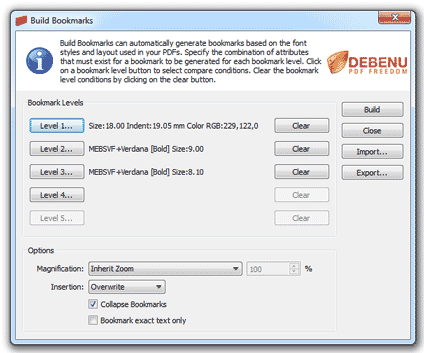 Build Bookmarks – Automatically build PDF bookmarks by specifying the attributes to look for. Find and Replace – Search and replace or delete bookmarks and optional revise properties. 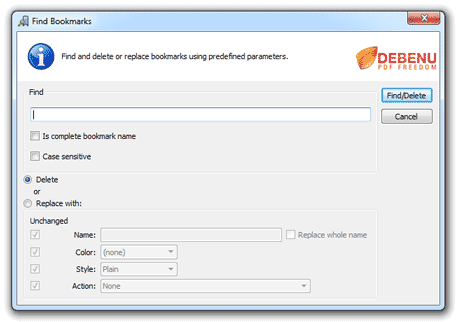 Delete Bookmarks – Remove all bookmarks or only broken bookmarks with a single click. 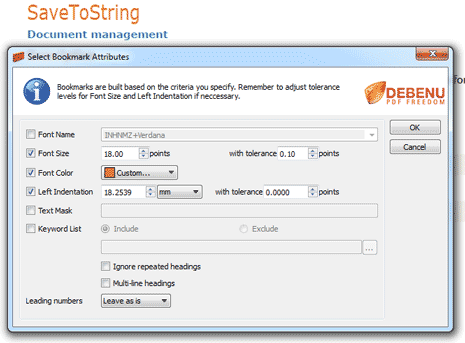 Bind Documents– Interlink PDF files automatically by generating a common set of bookmarks. Edit All Bookmark Properties– change all bookmark properties and actions in the current PDF. Sort Bookmarks– Automatically rearrange bookmarks in alphabetical order. Advanced sorting. 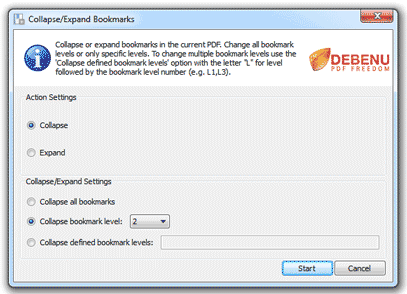 Collapse and Expand Bookmarks– Collapse or expand bookmarks for a specified level. Batch Processing – Use the Add, Build, Find and Delete Bookmark commands in batch process. Insert Destination Offset – for documents which do not use named destinations and have broken bookmarks due to missing or new pages. Insert Bookmark Every nth page – create a bookmark from every Nth page. Where N is variable set by user. Name: The text to be displayed in the bookmark. Color: The color of each bookmark, with support for all custom colors. Style: The font style. Set each individual bookmark as Normal, Italic, Bold and Bold Italic. None: Bookmark has no action, is used as text display. WWW Link: Links to specified URL (Web site address). GoTo Page: Links to specified page in the PDF file currently being viewed. GoTo Remote Page: Links directly to specified page of another PDF file. Open File: Opens specified file in its native view. Opens all file types supported on the system. Read Article: Displays an article thread in the active document. Show/Hide Field: Shows or hides form fields. Submit Form: Sends form data to a specified URL. Reset Form: Resets all form fields to their original default value. Import Form Data: Imports in form data from another file and displays it in the active form. Execute Menu Item: Executes a specified menu command. Movie: Plays a specified QuickTime or AVI movie. Sound: Plays a specified sound file. 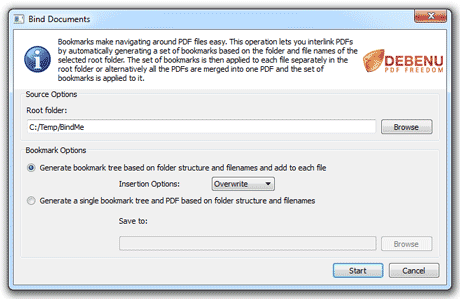 From current PDF – import bookmarks from the currently open PDF in Adobe Acrobat. From TOC of current PDF– generate bookmarks from the table of contents (TOC). From settings file – import bookmarks that have been previously exported. From folder structure – generate bookmarks based on folder and filenames. Use the Build Bookmarks feature to automatically generate bookmarks based on the font styles and layout used in your PDFs. 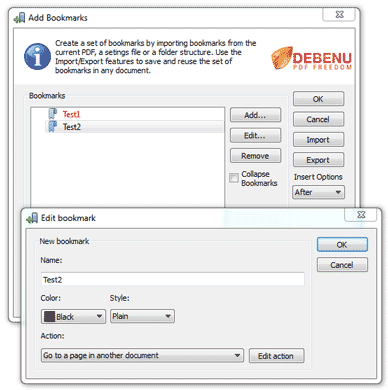 After setting the combination of attributes that must exist for a bookmark to be generated, Debenu PDF Aerialist can quickly scan one or more PDF files to build the bookmarks for each document. Additionally, you can save your Build Bookmarks settings by using the Import/Export functionality so you can reuse them to process large collections of PDF files. Setting up the Build Bookmarks process can be as simple as selecting heading styles and indentation level, or as complex as incorporating a range of Wildcards that let you build bookmarks based on the textual and numerical content of the PDF files. Font Name: only text using this exact font type. Font Size: only text in this size and tolerance. Font Color: only text using a specified color. Left Indentation: only text indented at this position from the left-hand side of the page. An example of when this could be useful is when bullet points are being used to indicate a heading type. Using a combination of the indentation and font name will make only that style get made into bookmarks. Text Mask: includes or excludes content as bookmarks based on the Wildcards you specify. Instead of searching a PDF file for the attributes (font name, size and color) and layout (indentation) the Text Mask feature allows you to search the text content of the files to include and exclude text from being made into a bookmark.Text masking is particularly useful when there are few defining bookmark properties — when the PDF files have not been structured well or consistently — or when you want to filter out bookmarks based on their text-based content. For more information on using the set of Wildcards take a look at the Debenu PDF Aerialist user guide that comes installed with the free demonstration. Replace Name: replaces the text to be displayed in the bookmark. Replace Style: replaces the font style. Set each individual bookmark as Normal, Italic, Bold and Bold Italic. Use the Delete Bookmarkstool to quickly remove all bookmarks from a PDF or use it in batch to remove bookmarks from a group of PDF files. In addition, the Delete Bookmarks feature includes an option to only delete dead bookmarks (bookmarks which have actions such as go to page x which are no longer valid and don’t work). Bookmarks make navigating around PDF files easy. The Bind Documentsfeature lets you interlink PDFs by automatically generating a set of bookmarks based on the folder and file names of the selected root folder. 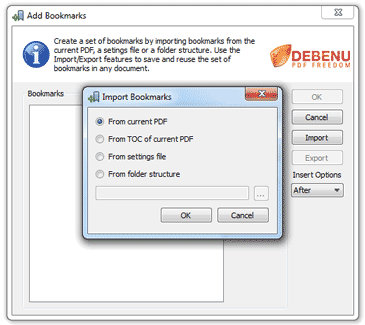 The set of bookmarks is then applied to each file separately in the root folder or alternatively all of the PDFs are merged into one PDF and the set of bookmarks is applied to it. This can be a very useful feature when you have a collection of PDF files which need to be distributed as a group with a common set of bookmarks to make switching between the different PDF files quick and efficient. 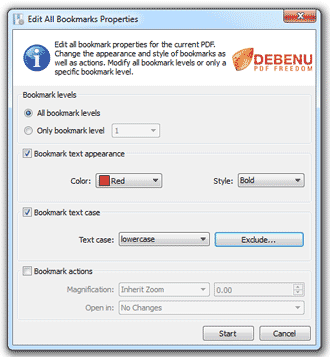 The Edit All Bookmarks Propertiesfeature offers a quick and easy way to edit the properties of all bookmarks in the currently open PDF. Change the text color, font style, text case and bookmark actions. Modify all bookmark levels or only a specific bookmark level. In this short video tutorial it goes over how to batch edit PDF properties using Debenu PDF Aerialist in Adobe Acrobat Professional. The Sort Bookmarksfeature has been updated to make working with multiple levels of bookmarks easier. 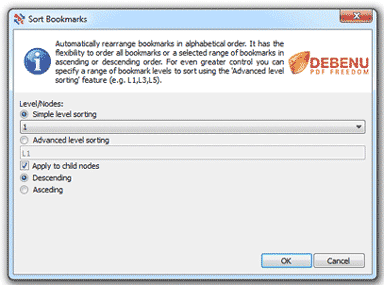 It gives you precise control over which bookmark levels are sorted. Collapse or expand bookmarks in the current PDF. Change all bookmark levels or only specific levels. To change multiple bookmark levels use the ‘Collapse defined bookmark levels’ option with the letter “L” for level followed by the level number (e.g. L1,L3). Use the Add, Build, Find, Sort and Delete Bookmark commands to process batches of PDF files. Adobe Acrobat Pro (not Standard) comes with its own Batch Processing (or Action Wizard as it is known in Acrobat X and later versions) tool that allows you to setup simple processes by combining a series of Commands. Debenu PDF Aerialist adds the Add, Build, Find, Sort and Delete Bookmark commands meaning you can combine these with Acrobat’s built in commands to process large batches of PDFs. To create a batch process, open Acrobat 9 or later and go to File > Batch Processing > Edit Batch Processes. Deletes existing bookmarks from all PDFs by using the delete bookmarks command. Adds a set of bookmarks that have been created using the add bookmarks command. Automatically generates bookmarks based on the font styles and layout you have specified using the build bookmarks command. Sets the open options in all PDF files being processed so they all display the bookmark pane when they are opened. When a page’s numerical ordering in a PDF is changed for any reason, this can result in broken links because links normally point to specific pages within a PDF. The Insert Destination Offset feature is for documents which do not use named destinations and have broken bookmarks due to missing or new pages. Such bookmarks can be fixed by inserting a destination offset for the affected pages. Bookmark 7 is removed and each subsequent bookmark page destination is decreased by 1 so bookmark 8 now becomes bookmark 7 and bookmark 9 becomes bookmark 8 and so on. Generating bookmarks every Nth page enables users to create a bookmark from every Nth page. Where N is number set by user. There are two practical uses for this. For example, if a user opens a 20-page document and set the N to 4, then bookmarks will be created for pages 4, 8, 12, 16 and 20. To generate bookmarks every Nth page, make sure you have Debenu PDF Aerialist 12 installed and open Acrobat 9 or later.